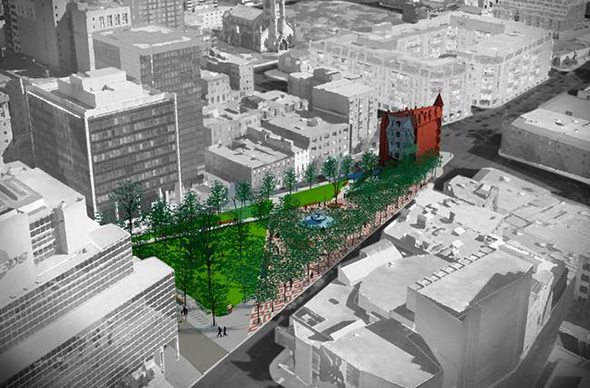 Berczy Park is located in the shadow of the Gooderham Building (a.k.a. the Flat Iron), and is a very busy place at lunch time as office workers take respite in the small section of green space. It's also become an increasing popular spot for dog owners as condo developments pop up in the vicinity of the St. Lawrence Market. Finding a way to make both of these groups happy (plus other stakeholders like children) was the challenge facing landscape architect Claude Cormier when he was commissioned to redesign the park a few years ago. After a lengthy community consultation process, the final plan reveals a design that works to divide the space for different users but also to foster interaction at the centre of the park. Cormier divides the park into the three segments so as to insulate kids and those eating their lunch from dogs, but through the use of a large dog-themed fountain that includes a water trough for thirsty canines, he also offers a major endorsement for four-legged users of this most crucial green space. Yes, that's right -- dog-themed. 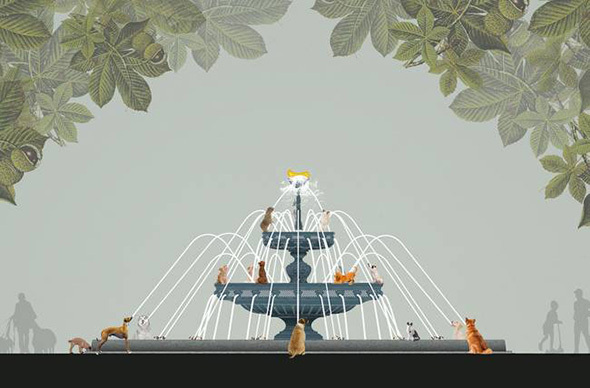 Along with the watering trough, the fountain will be outfit with a series of bronze-cast dogs at various heights and punctuated by a bone at the very top. It sounds like it could be tacky as hell, but the renderings suggest otherwise. This looks like one of those small pieces of architecture that make cities more enjoyable places to spend time.